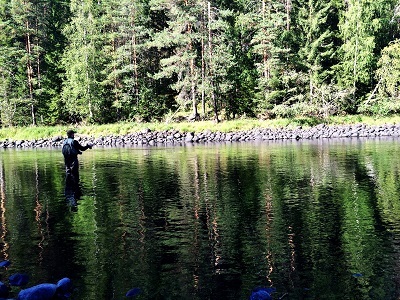 The 20th European Fly Fishing championship was settled at my home ground this year, with Ammerån as main competition water (Ösjön and Öravattnet was the other competition venues, but most of the sessions were held in the stream). Early on, I became involved with the England national team as a local guide, and later on I was involved in the competition from the organization side - this is my impressions of this spectacular event. As mentioned above, I got involved with the English national team - the team captain, Ian Greenwood, contacted me long before the competition and secured my engagement as the guide for the team. After some discussion we came up with a plan for a training camp, Thursday-Sunday the week before the competition. It was a quite tired, after the trip the day before, but really enthusiastic team I met at Överammers Mat & Prat on Thursday morning for the first training pass. A beautiful summer day - sunny and warm and hardly no wind. The first session was spent at the high end of the allowable training route, from below Skeftes down to the pool below Skattlandsforsen rapids. It was really interesting to observe these fly fishing professionals from a close range - the accuracy in how they analyzed the water, how they actively waded around and fished all the interesting streams and caverns, the active search for the best flies - a real joy to observe. They altered between upstream nymph fishing and traditional dry fly fishing and ... despite the extreme conditions (very low water levels and 20+ Celsius in the water) they catched fish all the time! 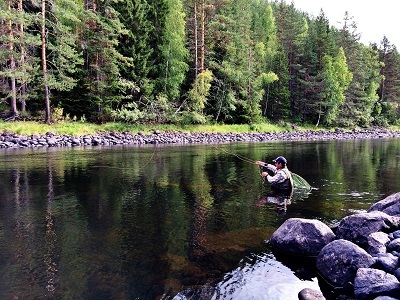 There is a clear difference in competition fly fishing and recreational fly fishing - when I, as an angler, are fishing a river, I want to find as big a grayling as possible, at least some large enough to take home and eat, and I will soon give up the fishing if I only get small fish. But these gentlemen were very happy with the fact that it was almost exclusively fish around 25 cm that stroke - since all catches of 20 cm and above was counted in the competition, this was the perfect size; they are found in large numbers, are relatively easy to capture. Yet another beautiful summer day, and another day at Ammerån - this session they wanted to go fishing where the river had a different character, with more calm and deep parts, so we started from Nyängesviken (also known as Playa Del Färsån or Färsåbaden - I had intended to start from Strandbäcken, but the Finnish national team had already occupied that beat). 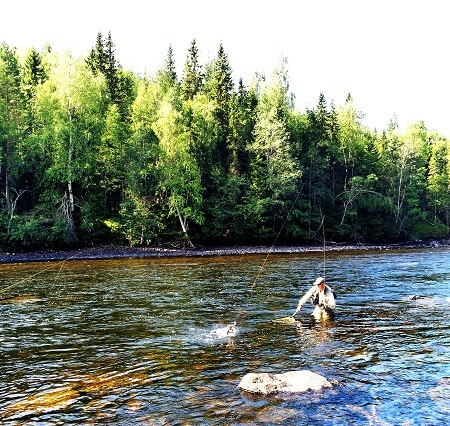 They fished as actively as the day before, but with a significantly worse result - not strange at all when the fishing is generally much better from Skattlandsforsen and upstream. Now this was nothing that got these men beaten down - quite the contrary, as they now had to fight harder for each caught fish and, if possible, be even more accurate than the day before. Since perch are counted in the competition, and the lakes, in addition to trout, holds a lot of perch, this day was to be all about perch-fishing. 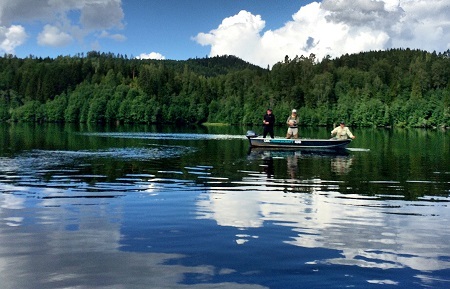 Some members of the team had never even fly fished for perch, so it was with eager anticipation we steered the boats out on the Indalsälven from the outlet of Ammeråns. Again, the team impressed with its accuracy - they searched different depths with different flies and lines with different sink rates. My favorite places worked as well as I had imagined beforehand, but they also found some new pits and they got a decent amount of perch over 20 cm (those who would have counted during the competition, that is). Besides the perch, they caught some pike, a decent white fish and a roach - we did not see any trout though. Overall a very enjoyable and rewarding day on the river, counting in the beautiful weather as well. Windy and overcast, but still quite warm. Ian and Simon were hungry for some more boat fishing, so I brought them to the Länglingen, that probably resembles at least Öravattnet more than Indalsälven does - the rest of the team spent the day at Ammerån. Upon arrival, we discovered that the Polish team was already there, but when the lake is large (about 7 km long), this fact was not at all any problem. The fishing was, as I suspected before, clearly worse than in the river, and it took quite some time between the bites. It was only towards the end of the day some real interesting things started to happen, when I, with my spinners, managed to figure out where to find some trout - it felt good that I finally could be useful in more ways then merely work as engine behind the oars this day. In the end, it was still a good day, even though it was a bit windy and not so many caught fish. I would like to take the opportunity to thank Ian, Tony, Scott, Andrew, Simon and Lewis for four fantastic fishing days! During the competition, I acted as a controller, and I was assigned stretch 4 of section 5 (lower Ammerån) - about 150 meters slow and deep (despite the low water) stretch, except at the very end where there was a small stream - one of the most boring stretches in the entire competition. As the inspector I was to make sure that the competitor followed the stipulated regulations, and also measure all the fish he managed to catch during the three-hour session. It was not as warm in the air as the week before (but still really comfortable), partly cloudy and some wind - great fishing conditions. Martin did not have his best fishing trip. To begin with, he spent almost the entire first hour down at the little stream, with no results - it did not seem to be any fish there, even though it looked really interesting. 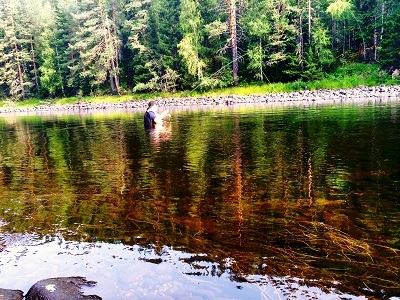 It also turned out that my stretch was really difficult to wade - it is much deeper than you think and you can be fooled by fact that the water is so clear - so he ended up taking a couple of baths. Once he started to fish the slow stream upstream, things started to happen - some grayling showed interest in the little brown dry fly he used. The result stayed at 15 registered grayling on dry flies, which was enough for ninth place (out of 14) in sector 5. It was quite a disappointed Scot who summed up the fishing pass - without the clutter and missed strokes, he thought the outcome could have been double in number. On the stretch directly above me a Spaniard was competing, and on the stretch below a Norwegian - they both got 24 registered fish. Cold and clear sky, a very beautiful morning. Marino inspected the stretch and came back, shaking his head - I mentioned that I had one of the most boring stretches of the race, right? Marino also started down by the stream and thereby threw away the first half hour - still no fish there. Upstream, it was, initially at least, a bit better, but not much - at half-time only two grayling were registered. After halftime, he discovered that the grayling stroke on the dry flies when they started to strip (i.e. when they were fished downstream), and the result improved. Fishing the calm part of the stretch requires quite a long roll, and it makes it difficult - he missed a lot of fish and struggled with knots and jams on the leader. This brought out his Italian heritage and the long Italian expletive chants echoed over the riverbank area. Marino finally got 11 registered grayling, which put him in 11th place in the sector. Above me a pole got 37 fish, and below me a Norwegian got the impressive number of 48 fish. Bogdan was full of confidence, and was sure this would be a success, after studying the route. 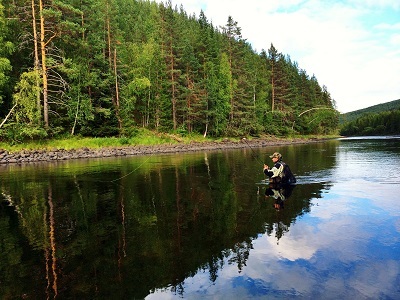 When he was told that a Scotsman and a Swedish guy fished there before, he was happy - Scots and Swedes can not fish with nymphs, but Romanians can, and he would get lots of fish in the stream. 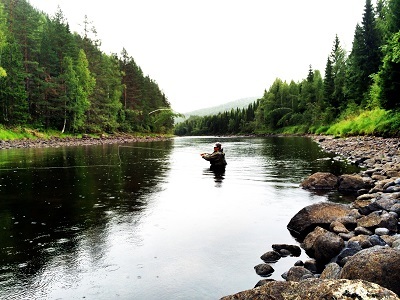 However, the stream delivered as bad as the previous sessions, and Bogdan had to do as the Scot and the Swede and switch to dry fly fishing on the slow part of the stretch after a while. He exclusively fished upstream on the few fish that showed them self, and he became more and more frustrated - a dry fly fished downstream had certainly made a better job, but he never figured out to try that. He was the most technically skillful fisherman I had on the stretch - just a few missed strokes and no hassle, but he anyway got no more than 8 registered grayling, which was enough for tenth place in the sector. Above me had an Italian got 10 fish, and below me a pole got 14 fish - it seems that the previous sessions is starting to show. Overcast right from the morning, but in good time before the session started it cracked up and was really sunny and nice - and by then some fish was starting to show them self on the river. Albert was wise enough to skip the faster stream, and got seven grayling on small dry flies during the first hour. He gave me another proof that it was hard to wade on my stretch, but he kept his spirits. After the first hour the weather changed - it blew up and big clouds swept across the area - and in doing so the fishing became completely dead (not just for Albert - even above and below us, the fishing got ice cold). It took an hour before the fishing started to give result again, and during the last hour I registered another 6 fish for Albert, most of them captured on dry fly fished downstream. 13 fish was a good result and he ended up in a good 5th place in the section. Above me a Fin got a 10 fish, and below me an Italian got 20. It had clouded more and more during the day and at the start time its rained some, a rain that came and went during the session. Even My skipped the stream in favor for dry fly fishing on the slower parts, and she caught 5 fish in difficult conditions. Being short did not do wading easier, and pretty soon she was totally soaked - the last hour she was so frozen that she could not change flies any longer, and when the session was finished, she drew a sigh of relief - a tribute to My for her fighting spirit up to the last minute! The five fish was enough for seventh place in the section in this, in general, difficult session - above me, an acquaintance from the week before, the Englishman Hendrie, got 11 fish, and below me a Czech got 10 fish. The favorite team of Czech Republic succeeded, after a weak fourth session, sprint to the gold, and individually the Czech Adam Tomas was pretty superior. "My" England were unlucky with the drawing of lots in the last session when one of the participants was placed on one of the fish-less sections - this was probably what put them outside the medalists. The format of the competition can be discussed - that the drawing of lots means so much. There were some stretches where there simply were hardly no fish at all, and if you got such a stretch you definitely ended up in the bottom, no matter how good fisherman you are (as an example, there was a total of 147 fish caught on the best stretch of section 3, and on the worst only 1). When the contest was settled by counting together every teammates points in all sessions (a first place on a session got you 1 point, where for a second place you got the 2 - the fewer points the better - and no fish on a session was given to 14 points, no matter how many people that ended up without any catch) so it was very noticeable with a bottom position. So, even though it was probably the four best teams that ended up in the top four, it feels a bit haphazard how they was placed - the results from the Dead Lake, and if you were unlucky enough to get one of the fish-less sections, meant too much for the final result. Obviously Ösjön should not have been one of the competition water - not only did it play too large a role in the final standings, it was also embarrassing to present such a poor fishing ground for the European championships. It is more difficult to come to terms with the fact that different stretches contains a different amount of fish. Some stretches were more or less empty, and that can partly be explained by the extremely low water level - at normal water level it would probably not have been so bad, and the water level can of course not be known when planning how the routes should be - and there has to be enough with stretches for all competitors of course, so that the amount of fish varies you can not do anything about. To try to compensate for that, the competition should have expanded to include another session, and in the end result, each participant's worst result should have been excluded - then we would have had a more accurate final result. Despite these shortcomings in the format of the competition, this was an incredibly fun event to attend, both before as guide and during as a controller - all these talented and nice fly fisherman that I met, and all the impressions I got that I'm sure will be put into practice in own fishing - I really hope that the organization will apply for holding the fly fishing world championships a few years from now!